Although it irritatingly shows no sign of decreasing in popularity, karaoke is one of the most obnoxious things a person can do with a microphone. 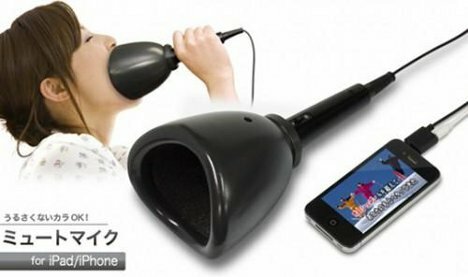 Thankfully, this odd-looking contraption promises to let you play karaoke games on your iPhone (wait, there are karaoke games for the iPhone?!) without causing too much irritation to those around you. It involves sticking something that looks like a plunger over your mouth, which is probably what everyone wanted to do while you were singing out loud anyway. 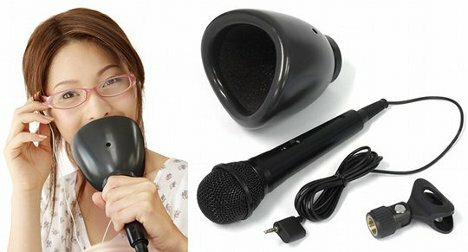 The Noiseless USB Microphone operates on a simple enough idea. A regular microphone is surrounded by a plastic cup that is supposed to fit over your mouth and stop all of the sound waves from hitting anyone’s ears while you sing. The accompanying app records your singing and plays it back for you, apparently letting you judge your own note-hitting accuracy. It seems doubtful that a little piece of plastic could stop the impossibly powerful tones of karaoke enthusiasts in close quarters, but we are fully behind any device that seeks to protect our ears from amateur crooners. You would have to be quite dedicated to spring for this particular gadget, though: it will set you back an insane $93 plus $20 for shipping. Still, when you gotta sing, you gotta sing – and now you can do it on the bus without fear of being kicked off. See more in Phones & Mobile or under Gadgets. February, 2012.